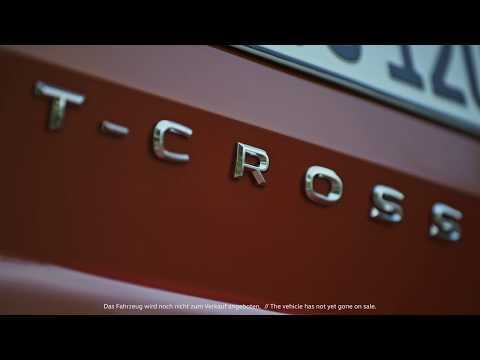 The new T-Cross is a true all-rounder. The inexorable rise of the SUV continues. With the new T-Cross, Volkswagen brings its SUV range up to five models. The Polo-based T-Cross is the baby of the range, slotting in beneath T-Roc, Tiguan, Tiguan Allspace and Touareg – but it has the appeal and the credentials to be one of the biggest sellers. The T-Cross is a strong and well-resolved design, clearly related to other SUVs in the VW range. From the front it features the familiar VW logo and grille, with distinguishing features that include dynamic built-in ‘hockey-stick’ LED daytime running lights and a striking chrome O shape surround to the cornering light. At the rear, a funky full-width reflector bar and LED tail light clusters make a strong impression. Although it’s based on the same platform as the Polo you sit higher and enjoy a versatile space inside. The sliding rear bench seat can be adjusted to give you extra legroom or more boot space, with up to 455 litres with both seats upright. The rear seats split and fold to accommodate up to 1,281 litres and you can make extra space by altering the height and length of the centre armrests. Choose the Style package and you’ll enjoy subtle interior lighting accents. You can further personalise the T-Cross with a choice of 16- and 18-inch alloy wheels, including the “Nevada” alloys in black with a burnished finish. From its contemporary styling to its distinctive rear with striking reflective strips and LED tail light clusters the new T-Cross is guaranteed to make a lasting impression. The LED headlights of the T-Cross have a signature style – especially the dynamic built-in ‘hockey-stick’ LED daytime running lights and you can’t fail to miss the O-shaped chrome element in the bumper which surrounds the cornering light. The wheels are just one way you personalise the T-Cross with our extensive range of 16- and 18-inch alloy wheels, like the “Nevada” alloys in black with a burnished finish. The T-Cross interior is both versatile and adaptable, which means you can configure it to your personal needs. There is a wonderful feeling of freedom thanks to the raised seating position and roominess. With a boot capacity is up to 455 litres and if you still need more, you can increase the loading space with the split, sliding rear seat bench and by altering the height and length of the centre armrests. One of the key features of the T-Cross is its amazing versatility. A good example is the sliding rear bench seat, which can be adjusted to give you extra legroom or even more space luggage capacity. The background lighting of the "Style" package applies subtle accents to create a unique atmosphere, especially at night. Our Car-Net App Connect transfers your smartphone apps onto the touchscreen of your Infotainment system. Supports Apple CarPlayTM, Android AutoTM by Google and MirrorLink®. The new 12.3 inch TFT colour Active Info Display boasts a higher pixel density, more intense colours, brightness, and contrast. Display additional content, such as the rev counter, speedometer and mileage recorder, on the instrument cluster. Everyone in your T-Cross can enjoy the first-class sound experience from BeatsAudio. The subwoofer, with its ultra-deep bass notes is guaranteed to create vibrations in the pit of your stomach. All the boxes are fired by an 8-channel amplifier with a 300 watts output, powerful enough to move both you and your passengers. The “Comfort” mobile phone interface keeps you connected and safe while driving and can be operated from the multi-function display, the steering wheel or the radio touchscreen. Drop your smartphone into the built-in storage compartment to use the inductive charging function, so there's no more unsightly cables. The inductive connection to the external aerial ensures interference-free reception for the hands-free function. The new T-Cross has been designed with the highest levels of safety in mind. Features include Lane Assist, which can detect whether the vehicle has wandered from the marked lane and will make a steering correction to bring your attention back to the road. The Blind Spot sensor uses LEDs in the wing mirrors to warn about vehicles in the blind spot. When reversing, the built-in Rear Traffic Alert monitors the area behind the T-Cross, warning you of any traffic crossing your path. The Manoeuvre Braking Function automatically applies the emergency brake to help you avoid collisions when reversing at speeds of up to 6 mph. You can also activate manoeuvre braking at the press of a button when driving forward. The “Blind Spot” sensor uses LEDs in the wing mirrors to warn you about vehicles in your blind spot. While reversing, the built-in Rear Traffic Alert monitors the area behind your vehicle, warning you of any traffic crossing your path. The Park Distance Control assists parking by sounding and giving you a visual warnings if it detects obstacles in front of or behind your vehicle. The built-in Manoeuvre Braking Function automatically applies the emergency brake to help you avoid collisions or reduce their severity when reversing at speeds of up to 6 mph. And when driving forward, you can activate manoeuvre braking at the press of a button. Verdict: more and more drivers are choosing the extra versatility, space and more commanding driving position of an SUV rather than their saloon or hatchback equivalents. Volkswagen’s Polo is a very fine supermini indeed, but if you’d like an even more versatile package with minimal difference in driving dynamics or fuel efficiency, check out the T-Cross. Or contact your sales team and they’ll let you know when it’s available for test drives. Read more in theT-Cross brochure.